Sean Kelly Gallery will be open by appointment only at 528 West 29th Street until we re-open to the public at our new gallery space at 475 Tenth Avenue in October. Sean Kelly announces the development of a new 22,000 square foot space at 475 Tenth Avenue in a historic 1914 building. The two story gallery, designed by award-winning architect Toshiko Mori, will be the first of its kind in this rapidly developing neighborhood adjacent to the Hudson Yards development. Sean Kelly will open the new gallery in the fall of 2012 with a series of events culminating in its inaugural exhibition. The move to the new space, more than three times the size of the current location, is the result of 18 months of strategic growth for the gallery as evidenced by its expanded roster of artists including the additions of: Idris Khan, Peter Liversidge, Nathan Mabry, Alec Soth, Kehinde Wiley and, most recently, Terence Koh. Further, the appointments of new staff and increased participation in art fairs worldwide has greatly heightened the gallery’s international presence and made such an expansion essential. 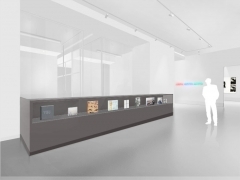 This move north of West 30th Street will, in a trailblazing initiative, open up fresh territory for New York galleries, as the new gallery is adjacent to the extraordinary urban development of the Hudson Yards area of Hell’s Kitchen. The new Hudson Yards district will be a vibrant, pedestrian friendly neighborhood that will see the proposed completion of the High Line park to 34th Street and extension of the No. 7 subway line to 34th Street and 11th Avenue. The glass-canopied subway station entrances will also be designed by Toshiko Mori Architect. With the new re-zoning, this area has the capacity for 12 acres of public open space, approximately 26,000,000 square feet of office development, 20,000 units of housing, 2,000,000 square feet of retail and 3,000,000 square feet of hotel space. Since the gallery’s first location opened on lower Mercer Street in 1995, followed by the move in 2001 to north Chelsea on 29th Street, Sean Kelly has sought out space on the exterior perimeters of gallery neighborhoods, drawing visitors with the strength of its internationally acclaimed exhibition program. The new space will enable Sean Kelly to continue to grow its programming and exhibition capabilities, further enabling its roster of artists. Sean Kelly is excited to be the first gallery to commit to the development of this dynamic neighborhood.